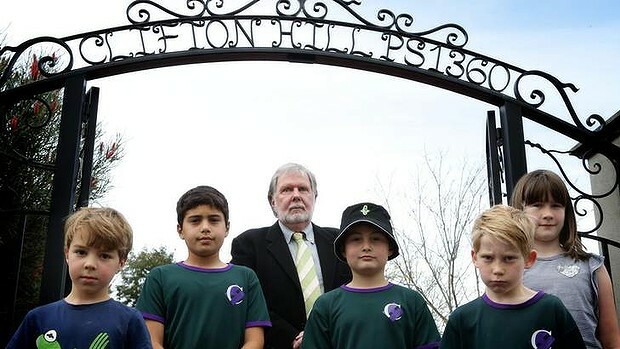 Clifton Hill Primary School principal Geoffrey Warren with some students unhapy about proposed east-west tunnel. Clifton Hill Primary School could suffer a mass exodus of students if a planned east-west link ventilation stack is built in the neighbourhood. The school council has criticised the state government's comprehensive impact statement (CIS) for the road project for lacking detail on the health effects of stack emissions and called for independent air-quality monitoring at the school starting immediately. Original east-west link designs placed the ventilating system just a block from the school grounds. School councillor and parent Melanie White said the CIS had not examined properly the impact of air pollution on the school. She accused the government of being out of touch with the level of anxiety in the community. ''Really we want some scientific evidence of what's going to happen. At this stage we don't have any information, so we can't allay the fears of parents because we just don't know,'' she said. Clifton Hill is considered among the best primary schools in the state, yet a recent poll has revealed 30 per cent of parents would consider removing their children if the road project goes ahead. It was previously believed the ventilation stack would be 80 to 100 metres from the school, on the corner of Gold Street and Alexandra Parade. A government spokeswoman said the ventilation structure would be near Alexandra Parade and close to the tunnel opening, but the exact location would not be chosen until the final design. ''We will have a monitoring station in place at the eastern end of the project, around Alexandra Parade, well ahead of construction,'' she said. The school council is angry that such an important decision has been handballed, despite assurances that additional air-quality assessments would be required. ''We seek a firm undertaking that pollution levels will be carefully modelled in advance, monitored after construction and that any increase in pollution levels as a result of the project would be properly addressed,'' the school's CIS submission said. The school council also wants to know if the stack will be visible from the school and what would happen if there was a large fire in the tunnel.